Membrane composed of SBS modified bitumen with a composite polyester reinforcement. The uppers surface is finished with granules. The selvedge is protected with a polypopene film. 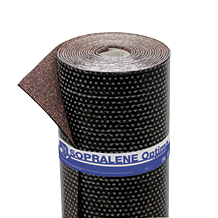 The lower surface is protected by a micro-perforated thermofusible film with a talcum/ sand finish. SOPRALENE OPTIMA C3 GmF has CE Marking: EN13707.